I have a rule about being able to pronounce the food I eat. Take quinoa, for example. This superfood has gained a lot of popularity in recent years—and it’s a name that you will want to remember for years to come. It may not look like it, but the food is pronounced KEEN-wah. Quinoa is popping up everywhere, from being added as a main ingredient in granola bars to being featured as a signature dish in restaurants. In fact, the Food and Agricultural Organization of the United Nations acknowledge quinoa for its “high nutritive value.” NASA astronauts even bring quinoa along with them during long spaceflights! But quinoa is more than a trendy superfood for spacemen. The Incas have referred to quinoa as the “mother of grains.” Although it is cultivated for use as a grain, quinoa is actually a seed. It is harvested from a plant called goosefoot and has been used since 3000 B.C. in Bolivia, Peru, Argentina, Columbia, and Chile. Quinoa is from the Amaranthaceae family, and it closely resembles another healthy seed called amaranth. It is also from the subfamily Chenopodium quinoa, and it is related to other plants like spinach, Swiss chard, and beets. 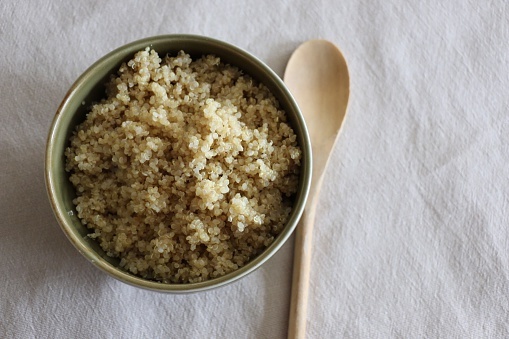 Quinoa was an important food staple for South Americans, as it was known to increase stamina in Aztec warriors. In the late 1980s, farmers John McCamant and Ernie New began cultivating quinoa in Colorado—it rapidly began gaining popularity across North America. Quinoa is an important part of every healthy diet. In fact, the nutritional status of quinoa is pretty close to perfect. It is famously known as a complete protein food. In other words, it contains all nine essential amino acids. In particular, there are large amounts of the amino acids isoleucine and lysine found in quinoa. It is also considered a high-fiber food, and it contains almost four times the calcium than wheat. Quinoa contains the monounsaturated fat, oleic acid, and the omega-3 essential fatty acid alpha-linolenic acid (ALA). It is a great antioxidant source and includes phytonutrients such as vanillic acid, hydroxybenzoic, coumaric, and ferulic. Quinoa is filled with the flavonoids kampferol and quercetin. It contains the anti-inflammatory polysaccharides rhamnogalacturonans and arabinans. The health benefits of quinoa also stem from the many vitamins and minerals inside the super grain. Quinoa contains the gamma-tocopherol form of vitamin E, as well as vitamin B1, B2, B3, B6, and folate. It also contains good sources of magnesium, manganese, iron, zinc, potassium, copper, and phosphorus. The high potassium in quinoa helps regulate sodium in the blood. Potassium is also important for lowering blood pressure, and it helps counteract the effects of salt. Some studies even indicate that low potassium can increase blood pressure in patients with hypertension. 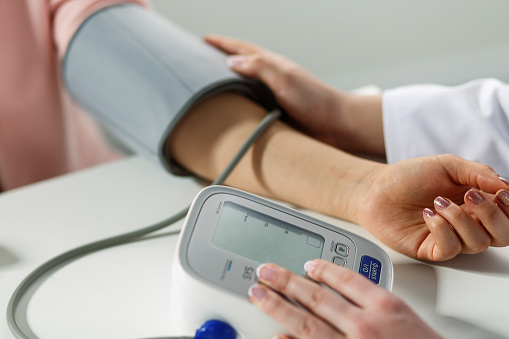 Potassium can also lower blood pressure when the patient has normal sodium levels. People can easily maintain sodium levels by avoiding processed food in their diets. The magnesium in quinoa lowers blood pressure naturally by inducing blood vessel dilation. 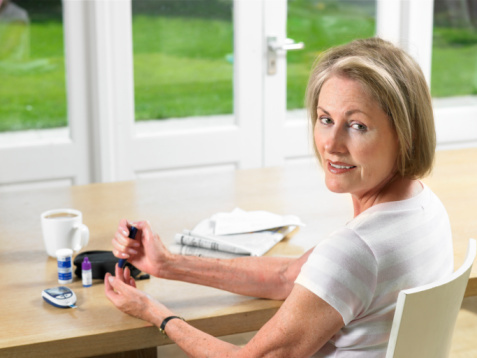 In a meta-analysis published in the European Journal of Clinical Nutrition, researchers found that magnesium could significantly reduce blood pressure. Both magnesium and potassium are great for lowering blood pressure; however, they are better together, and quinoa makes for the perfect food that lowers blood pressure naturally. Lowers risk of diabetes: Quinoa is a good source of fiber and protein, which can help regulate blood sugar. It also contains anti-inflammatory nutrients that reduce the development of type 2 diabetes, including vitamin E and phenolic acids. Quinoa ranks 53 on the glycemic index (GI)—keep in mind that a GI below 55 is considered low! Helps reduce cholesterol levels and promotes cardiovascular health: The high fiber content in quinoa may reduce cholesterol levels. In a 2010 animal study published in the journal Plant Foods for Human Nutrition, researchers discovered that quinoa can reverse the detrimental effects of cholesterol in rats. The magnesium in quinoa is also an important nutrient that can reduce the risk of heart disease, stroke, and heart attack. Important for restful sleep: Quinoa also contains important sleep-promoting nutrients such as magnesium, calcium, and the amino acid tryptophan. Great as part of a gluten-free diet: Quinoa is also a great food for people with gluten intolerances or allergies. Other non-gluten grains include millet, amaranth, rice, teff, and sorghum. How Can You Fit Quinoa Into Your Diet? It can be a challenge to incorporate new foods into your diet. Luckily, quinoa tastes great and it can easily fit within any diet—plus, there are a variety of quinoa options. The most common quinoa color is white, or it may look transparent yellow. Other quinoa colors include black, orange, pink, purple, and red. It can taste sweet, bitter, or nutty (the black quinoa is thought to be sweeter than the other varieties). You may also find quinoa paired with its cousin, canahua (Chenopodium pallidicule). It is often called baby quinoa, and it pronounced kan-ya-wa. Sprinkle cooked quinoa on your favorite salad for extra protein. Add quinoa to your soup. Enjoy quinoa for breakfast—it can be purchased as flakes. Pair quinoa flakes with nuts, seeds, and fruits for a tasty morning meal. Quinoa flour is a perfect option for gluten-free baked goods, such as muffins and cookies. Quinoa flour is often paired with rice or amaranth to form gluten-free pasta—it goes perfectly with pesto or other favorite homemade sauces. Quinoa is extremely easy to cook. It may be necessary to rinse the quinoa with water before cooking to get rid of its protective residue layer called saponin. However, there are some quinoa brands that come pre-rinsed. Next, combine a cup of quinoa with two cups of filtered water, and add some Celtic sea salt. For extra flavor, you can also toast the quinoa seeds on the stove for about three minutes before adding the seeds to the water. Bring the water to a boil then reduce the heat to low. Cover and continue to cook for 15 to 20 minutes. After the water has been absorbed, the quinoa will look fluffy. Let it stand for about five minutes; then you can use it for any dish you desire. Mash the banana in a large bowl. Then add in and stir the tahini, honey, and vanilla extract. Add the nutmeg, cinnamon, cardamom, hazelnuts, and rolled quinoa. Then stir and spread the mixture on a baking sheet with parchment paper. Bake in the oven for 45 minutes to an hour. Stir the mixture every 15 minutes to avoid uneven browning. 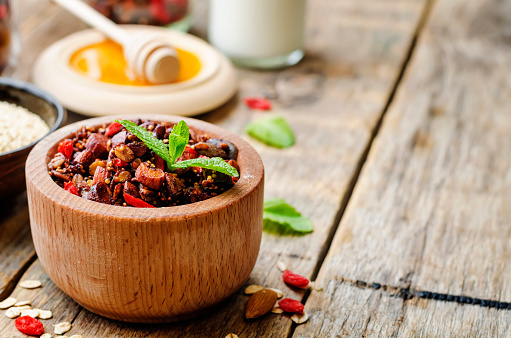 Remove the granola from the oven and stir in the goji berries, cranberries, and flaxseeds. Cool the granola then transfer it to an airtight container for safe storing. Combine cooked quinoa, eggs, and salt in a medium-sized bowl. Stir in the chives, cheese, garlic, and onion; then add the brown rice breadcrumbs. Let it sit for about five minutes. Heat a large skillet with ghee and shape 12 quinoa patties, each about one-inch thick. When the skillet is hot, place the patties to cook covered for about five or six minutes until golden brown, and then flip and cook the other side. Quinoa is considered a powerhouse food that is safe to eat, and most people can digest it without any adverse reactions. However, there is one minor precaution with quinoa—it may contain a high amount of oxalates. Too many oxalates can interfere with the absorption of calcium. Mateljan, G., The World’s Healthiest Foods: Essential Guide for the healthiest way of eating (Seattle: George Mateljan Foundation), 672-675. Murray, M., et al., The Encyclopedia of Healing Foods (New York: Atria Books, 2005), 348-350. “Can you tell me what oxalates are and in which foods they can be found?” The World’s Healthiest Foods web site; http://www.whfoods.com/genpage.php?tname=george&dbid=48, last accessed July 3, 2015. “A cautionary tale about eating high oxalate foods,” Stop the Thyroid Madness web site; http://www.stopthethyroidmadness.com/oxalates/, last accessed July 3, 2015. Daniluk, J., “Five health benefits of eating quinoa,” Chatelaine web site, May 2, 2011; http://www.chatelaine.com/health/diet/five-health-benefits-of-eating-quinoa/. “Lower Blood Pressure with Quinoa – The Super Grain,” Hello Heart web site, May 20, 2015; https://helloheartapp.com/quinoa-reduces-bp/. Krishna, G.G., “Effect of potassium intake on blood pressure,” Journal of the American Society of Nephrology 1990; 1(1): 43-52. Kass, L., et al., “Effect of magnesium supplementation on blood pressure: a meta-analysis,” European Journal of Clinical Nutrition 2012; 66(4): 411-418. Zack, J., “All About Quinoa: Health Benefits, Cooking Tips, & More,” Built Lean web site, April 3, 2013; http://www.builtlean.com/2013/04/03/quinoa-health-benefits-cooking-tips/. Pasko, P., et al., “Effect of Quinoa Seeds (Chenopodium quinoa) in Diet on some Biochemical Parameters and Essential Elements in Blood of High Fructose-Fed Rats,” Plant Foods for Human Nutrition 2010; 65(4): 333-338.